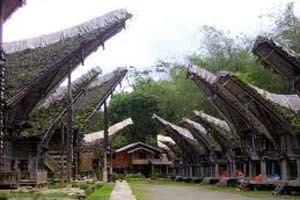 The characteristic of Tongkonan is the upside down door, the roof is covered by black palm fiber, the shape looks a lot like facing downward ship with stern, there even some people describing it as buffalo's horn and Tongkonan has to be built facing north. Local people believe that their ancestors' spirit live in the north and if someone dies, they believe this person's spirit joinstheir ancestors in the north. If you're lucky you can watch several traditional ceremonies, mostly there ceremonies are held between June to December. Among those ceremonies there's Rambu Solo (mass and enliven funeral ceremony done in 3 to 7 days in a row), Rambu Tuka (traditional ceremony in entering new house) and other traditional ceremonies. If you come to this tourism village, you will be charged for about IDR 5,000 for domestics and IDR 10,000 for foreign tourists. Look for more Cheap Flights to Culture.